The latest of our proofreading projects to be completed is The Brighton Boys in the Trenches. The Brighton Boys series is something that may be a bit hard for the modern reader to imagine: books for young boys glorifying the act of going to war, written during an ongoing conflict. 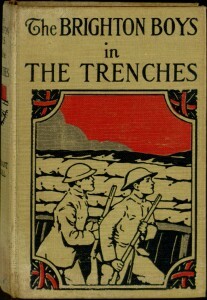 Using the same basic hardcover series format as Tom Swift or the Bobbsey Twins, these books provide juvenile adventures in various World War I contexts. Unlike many similar series, though, the Brighton Boys books do not follow the same heroes from title to title; instead, each adventure features different students from the fictional Brighton Academy. Given the subject matter, there is a rather grim reason for this atypical format! 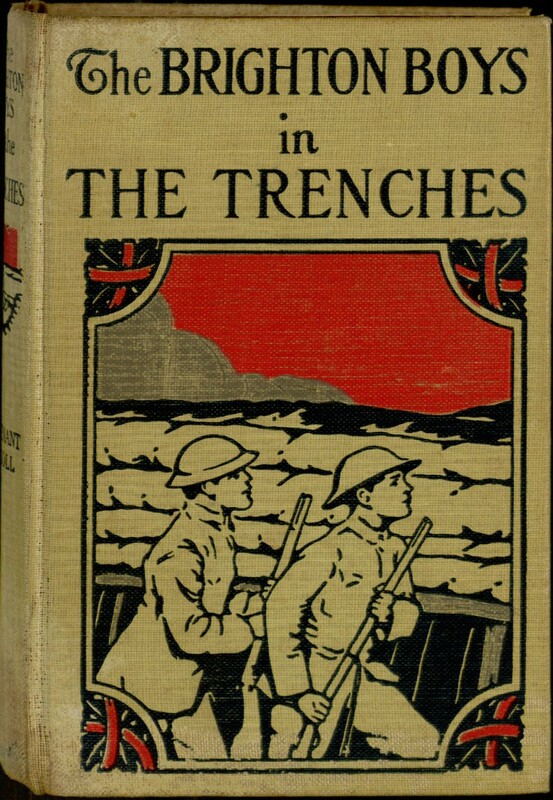 While the overall series concept is itself a bit shocking, The Brighton Boys in the Trenches goes a step further by dealing with what is probably the dirtiest and most horrific aspect of a dirty and horrific subject: trench warfare. The plot is simple enough: after encountering a boastful German, Herbert Whitcomb, a 17-year-old orphan with an eye for shooting, leaves school to enlist along with his Irish sidekick Roy Flynn. Before long, they are engaged in combat in France, facing gas attacks, trench foot and other dangers! As a work of fiction, the book leaves much to be desired. Its main characters are two-dimensional at best, and the prose is littered with long, awkward, nearly-unreadable sentences. The author’s most ambitious attempt at achieving literary merit appears to be having one of his characters name a gun after a Dickens character. The plot is thin, just a series of action-filled incidents loosely strung together. However, despite its flaws, the book is quite interesting as a piece of social history. The early portions of the book, set in America, have a decidedly paranoid tone. Germans and their agents are actively trying to turn the public against the war, and the book makes it very clear that acts of physical violence are perfectly acceptable to counter such dangerous speech. Once the action switches overseas, the book’s role as propaganda remains fairly clear. The Germans are generally referred to in dehumanizing terms, and while the conflict is unquestionably portrayed as dangerous, the text is designed to frequently imply American superiority and inevitable victory. That about sums up the book: a strange mix of series fiction shallowness and gritty realism, an uncomfortable compromise between propaganda and protest, and a rather unengaging read that is nonetheless fascinating throughout. If you are interested in experiencing the whole thing for yourself, you can read it online or download it in many popular eBook formats at Project Gutenberg.